DO LOWCHENS MAKE GOOD PETS? Yes, they were bred to be companion dogs. A Lowchen is a small dog that thinks it is a very big dog. They are devoted companions and take readily to people as well as other pets in the household. They are athletic, inquisitive and have even been described as clowns. Life is never dull with a Lowchen around. They abhor an empty lap, need to check out what you are doing and the neighbours, and they let you know if something is going on that they do not like. They do not make good kennel dogs. They do not like to be ignored. They are easy to train and respond well to positive reinforcement, treats please. They are excellent watch dogs. ARE THEY GOOD WITH CHILDREN? Yes, they are built in playmates though we suggest holding off on acquiring a Lowchen if you have very young children. The reason for this is that the Lowchen have very strong teeth. A good age is approximately 5- 6 years and up as by this age children know not to pull hair and tails, but of course if you have younger children, supervision around any type of dog is always recommended. ARE THEY EASILY OBTAINABLE? No, they are still a relatively rare breed but are becoming more popular as the secret is out. If this is the breed for you, the best place to find a lowchen is from a breeder. It may take 6 months to a year but the wait is well worth it. Most breeders will contact you if someone they know is having a litter and are very good about referrals to other breeders.. It is not unusual for a breeder to ask you to fill out a questionaire. Breeders are able to inform you about the true nature of the breed and allow you to view adult relatives of your new puppy. HOW DO I FIND A BREEDER? Most purebred dogs will have a national club and the Lowchen Club of Canada is a good resource. There you will find links to breeders and you can contact the ones nearest you. Dog Shows are another good source. CAN THEY DO PERFORMANCE SPORTS? Yes, Lowchen excel in agility. 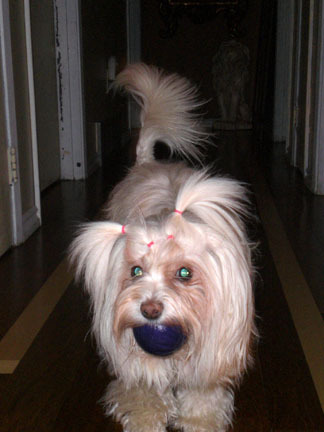 Many Lowchen love their balls and they are great candidates for Fly Ball. Not all Lowchen like water but if you have one that does, then by all means water sports are a go. As Lowchen love their food they make excellent trackers, so owning a Lowchen gives you lots of options for getting involved in almost any dog sport you want. ARE THEY HYPO-ALLERGENIC? Most people with allergies can get along with a Lowchen. There is little dander and Lowchens have hair not fur so like human hair, they do lose a few hairs but it is not all at once. Your lap will not be covered in dog hair after a cuddle on the couch. It is a non-shedding coat which requires brushing once or twice a week if kept short and trimming every 4-6 weeks. DOES THE HAIR GROW LIKE THAT? No, Lowchen have a single coat that grows long all over. It can come in any colour or combination of colours. It is the traditional Lion Clip that identifies the breed from other long hair breeds. We often recommend a short variation of the lion cut but many pet owners choose to keep them in a short puppy cut which is easier to maintain. A good groomer can help you with this or you can choose to clip yourself. DO THEY HAVE A LOT OF HEALTH PROBLEMS? Fortunately the Lowchen has few genetic problems and are fairly healthy. Like all breeds they do have health problems, cataracts are often common in older dogs as is congenital heart disease usually showing up at 8 plus years. Cushings has also been known to show up in the older dogs. PRA (progressive retinal atrophy) which causes blindness has been known to occur in the breed but these occurences are rare. Currently we CERF our dogs before breeding but this only lets us know the dogs do not have pra. There is no DNA test yet for this disease. Just as large breeds are prone to hip dysplasia, small breeds are prone to luxating patellas. We check all our dogs before breeding to make sure their patella's are okay. It can show up if a dog has had an injury as well. Puppy owners are advised not to do performance sports such as agility before they are fully grown but they certainly must start on obedience training early. While puppies are extremely active we advise you take care not to let them jump from high heights or broad jump from the top stairs. This will result in patella injuries. Puppy teeth have long roots so puppy owners need to be vigilant in watching the teeth and if they are not falling out to see their veterinarian to have the teeth pulled, sometimes surgically so that the adult teeth can come in. We usually advise to pull out any baby teeth at the same time you spay or neuter your pet. DO THEY DROOL? There is false information on the net that these dogs drool. They are a tight lipped dog so there is no drooling. Do not believe everything you read on the net. A breeder will be truthful as we know our dogs the best. The beard may spread some water from the water dish but if kept short this is not a problem.